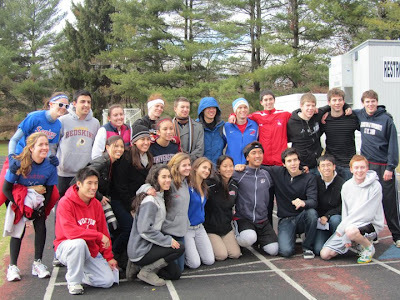 On November 27, 2010, from 1-3pm on a cold and blustery day, about 60 people who are some combination of Robert Yin's friends, burrito-lovers, and/or running enthusiasts gathered for a "Burrito Run" at the Wootton High School track. What is a "Burrito Run"? You literally eat a burrito - generally a hefty one from Chipotle - and then you run a race. Today's run was a one-mile race. Kerry Nisson, Jess Rinn, and Veronica Salcido, organizers of the Burrito Run, conceived of the event as a fun way to remember Robert Yin and raise money for a scholarship in his memory. Robert, Kerry, and Jess were Wootton alums from the Class of 2008, and Track and Field teammates for throughout their high school years. And fun it was. Spirits ran high. Most attendees brought a burrito, except Jonathan Loewy, Robert's good friend from Class of 2009, who brought a case of Krispy Cremes, "My stomach can run better on 10 donuts than a burrito." A table was set up at the Starting Line. Runners assembled at the table. Kerry gave the group the countdown, said "GO!" Her timer started ticking and folks began eating. One-by-one they finished eating, to the cheers of onlookers. Upon finishing the food the runner would take off for a one-mile run. Some runners clearly had a strategy to complete the task, while others had a wait-and-see approach. Veteran runner Cedric Dana, Class of Wootton 2007, was the First Place winner to finish both lunch and race. Cedric crossed the Finish Line while some folks were still eating! One feature of a Burrito Run that excites the spectators is the how the runners stomach react to the stress of eating and running. Yes, as predicted several unnamed runners vomited on the track, to the laughing and delight of the onlookers. Luckily for everyone involved, those runners who threw up were not anywhere near other runners when it happened, but were at least 50meters from the nearest person. Everyone finished. Look again at this blog and I will update it with some of the times people ran. Cost of admission was $3 or $5, and "YEAAA BOI - W.W.R.D" bracelets were sold for $5, plus several "Team Robert" t-shirts. The event raised about $350 for the SPIRIT Scholarship. The SPIRIT Scholarship will be given to a college-bound Wootton senior beginning in 2011. For more information on how to apply, visit the Scholarship page on www.RememberRobert.org. Robert Yin died tragically in May 2010 from head injuries, as a result of pole vaulting for Grinnell College at the NCAA Midwest Division III Track & Field Championships at Illinois College. Robert's friends and others braved the weather, and a good time was had by all at this Thanksgiving Day weekend Burrito Run.